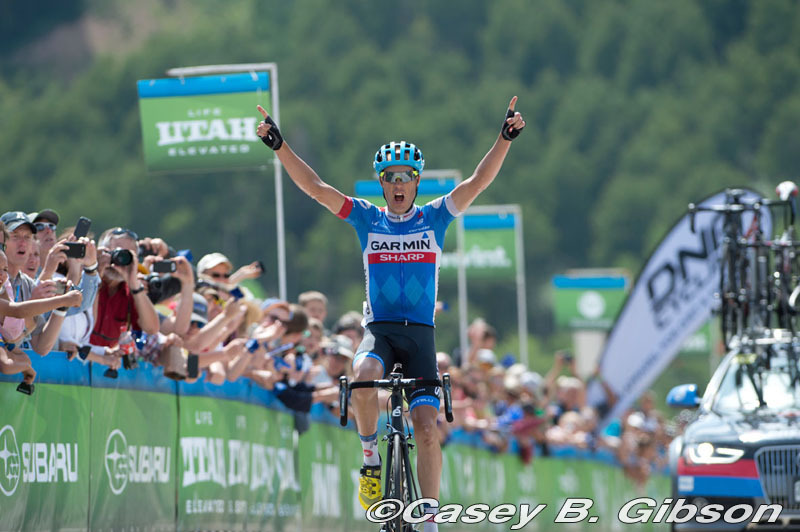 Defending Larry H. Miller Tour of Utah champion Tom Danielson (USA) of Team Garmin-Sharp powered away from an elite group of riders to win Stage 4 presented by Workers Compensation Fund on Thursday. Danielson soloed to victory on the epic climb of Powder Mountain in the final three kilometers to finish with a time of 4 hours, 18 minutes and 53 seconds. The American broke away from Lampre-Merida’s Chris Horner (USA), who he had battled last year on the slopes of Little Cottonwood Canyon, with three kilometers to go on the climb. The stage win for Danielson put him in the Larry H. Miller Dealerships overall leader’s jersey, with a 57-second advantage on the General Classification over Horner. BMC Racing Team’s Ben Hermans (Belgium) finished second on the stage, with Horner on his wheel for third. As expected, the first mountain-top finish of the 2014 Tour of Utah brought chaos to the overall standings. Jure Kocjan (SLO), Team SmartStop, who wore the Larry H. Miller Dealerships leader’s jersey for two stages, dropped to 41st on G.C., more than 24 minutes off the lead. Michael Schär (SUI), BMC Racing Team, dropped from second to 19th and previous third-place rider Serghei Tvetcov (ROU), Jelly Belly p/b Maxxis, moved to 14th on G.C. 2011 Tour de France champion Cadel Evans (AUS) of BMC Racing Team slipped to 9th on G.C., 2:43 off the pace. Starting in downtown Ogden, Stage 4 presented by Workers Compensation Fund passed the North Ogden Divide twice and mixed in a few loops around Pineview Reservoir. The 104.7-mile course concluded with a climb upward to Powder Mountain’s 8,156-foot finish line. Bissell Development Team rider Tanner Putt, who resides in Park City, Utah, lost his spot in the Top 10 and his Subaru Best Young Rider jersey after finishing 16:15 back and in 34th place overall. The Subaru Best Young Rider jersey will be worn on Friday by Clement Chevrier (FRA) of Trek Factory Racing. 3 Christopher Horner (USA) Lampre-Merida s.t. 6 Wilco Kelderman (Ned) Belkin-Pro Cycling Team s.t. 6 Alex Diniz Correia (Bra) Funvic Brasilinvest-Sao Jose Dos Campos s.t.